I don’t have much for cupboard space really, so I have tried to condense all of my baking ingredients into one cupboard. I’ve found that the key to organizing is storing like items with like, and storing the items where you use them in an easily accessible location. 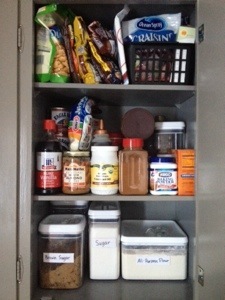 I love the clear airtight containers for storing the most common bulky ingredients. One extra tip is labeling! Label, label, label! I just hand wrote on the label tape I got at Walmart for the time being. Someday if I get bored, I may replace them with labels from my labeler for a more professional look.